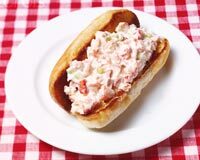 Lobster Roll is a scrumptious American recipe. Learn how to make/prepare Lobster Roll by following this easy recipe. Mix mayonnaise, diced celery and tarragon with lobster pieces. Toast the dog rolls with butter. Put lobster mixture in rolls.